For us, that means local, seasonal ingredients, an emphasis on taste and a relaxed, hearty menu. Sample menus are available below. To complement the enjoyable cooking from our team of enthusiastic chefs, we offer quality in the glass to match, with a fun, eclectic wine list and a well-stocked bar with great Suffolk cask ales and draught beers, plus an array of non-alcoholic alternatives and decent coffee. Bought in late 2016 by well-known Suffolk chef-restaurateur Jonathan Nicholson, Jonny brings his experiences from owning and running several Good Food Guide-recommended Suffolk destinations over the years such as The George at Cavendish, Carlton Manor and Southwold Pier. He also owns The Bell At Sax', a lovely neighbourhood restaurant-with-rooms on Saxmundham High Street. 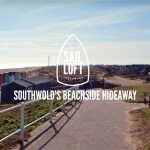 We hope you will visit Southwold and The Sail Loft soon and discover our relaxed cafe-restaurant-with-rooms and the simple, good food we like to be known for. Enjoy a selection of finger sandwiches, savoury treats such as our chef’s scotch egg and potted smoked mackerel with sourdough toast, fruit scones with cream and jam, cakes and slices with an unlimited pot of tea or good coffee and a glass of prosecco. Must be booked at least 24 hours ahead of your reservation date and it is not available during school holidays. PLEASE CLICK THE LINKS BELOW FOR OUR SAMPLE MENUS. OUR SAMPLE MENUS ARE ONLY A GUIDE TO OUR STYLE OF FOOD AND WILL NOT BE THOSE SERVED ON YOUR VISIT.